The last month of my internship working for the LH Group at the EU Affairs Office in Brussels has already arrived. 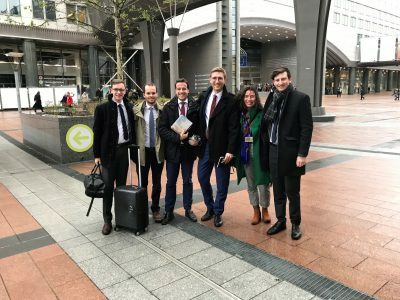 It is incredible how exciting and eventful the past weeks and months have passed by (you can read my first impressions about LHG’s EU lobbying in my post from November 2018). One of the main topics I was able to see, were the final lobbying activities towards a regulation on safeguarding fair competition in air transport in Europe – as you can imagine highly of interest to the Lufthansa Group. In 2017, the EU Commission presented a proposal to revise the old and barely effective Regulation from 2004. Looking fresh with my fellow-interns at the European Parliament. Since I have learned the theory behind decision-making in the European Union in my studies, I found it very cool to observe the “real thing” here in Brussels between the institutions and all the stakeholders involved. In such a long and complex process of policy-making, the Parliament, the Council and the Commission are responsible for finding an agreement on the legislation. At the same time, they are thankful and in need for expertise and knowledge from the affected stakeholders – such as the airline industry regarding this proposal – as they are not as familiar with the detailed and practical implications of those legislations. Lufthansa together with other airlines have provided information and facts for the decision-makers during the entire process to help them find a conclusion. We were in contact with Members of Parliament, the transport attachés of the Permanent Representations of Member States, and with the relevant departments of the Commission, in order to inform and convince them of our interests. As European policy-making is more accessible to stakeholders and interest groups than on national level, it is really inspiring to see how the different and sometimes very diverging views are taken into account during the negotiations and turned into policies. Discussing lobby activities during an IATA breakfast. The cool thing about the work in Brussels is that there are uncountable events and meetings on every relevant topic possible. As for aviation, I joined a breakfast event at IATA’s office about the current lobbying topics, milestones and outlooks for the airline industry. IATA is the worldwide representation of airlines, also based in Brussels. 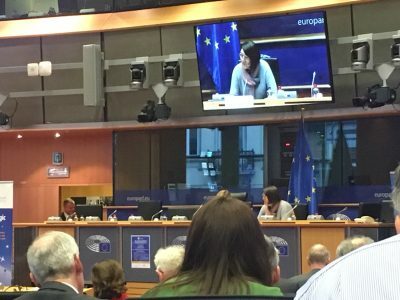 Together with representatives from other airlines, we talked about the outlook for 2019, since the elections for a new European Parliament will take place May 23-26 (Please do not forget to vote! It’s important and cool! https://www.what-europe-does-for-me.eu/). A new Parliament also means a new Commission. Hence, the upcoming weeks and months here will be more election campaigning than taking on new files in Brussels. Besides that, the Council Presidencies are also closely observed, as Member States in the driver’s seat determine agendas and long-term political strategies. The Lufthansa Group office has to stay alert and anticipate political developments that might have an impact on any of our issues. The same counts for staff or politicians who switch, leave or take on new offices. 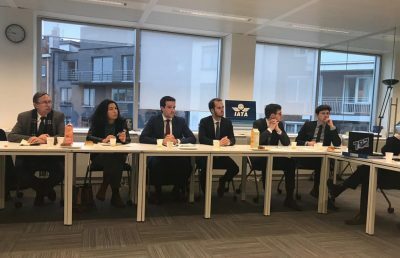 Speaking of offices and the Commission, after a few months into the aviation sector, I had a first impression of the who-is-who for LHG in Brussels. During several conferences I got to see Violeta Bulc (the EU Commissioner for Transport). One time I even shook her hand :) Again, this shows how approachable the stakeholders are in Brussels! Violeta Bulc, European Commissioner for Transport, giving a keynote speech at the EU Aeronautics Conference on how Europe can lead the way to sustainable and performance=based aviation. It is a tradition, fellow-interns from the LHG governmental affairs departments in Brussels, Berlin and Frankfurt organize visits for each other to the respective offices. It felt pretty exciting to go on my first business trip and fly out to FRA and BER for a day! (Yes, airport abbreviations are a thing!) In BRU I introduced my colleagues not only to yummy Belgian fries but also to the airline organizations IATA and A4E and impressed them with visits to the EU institutions. 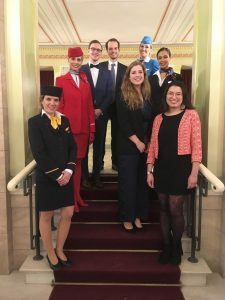 In BER we got to help during Lufthansa Group’s New Year’s Concert (together with real flight attendants in their uniforms). Our last stop of the tour was FRA where we were welcomed in the impressive and shiny Lufthansa Aviation Center, where we had a look into different departments and on the runway. Obligatory picture time for us interns with flight attendants in the Berlin Konzerthaus.